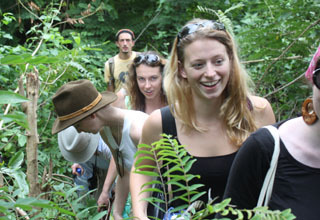 Philippa Baker-Rabe spent seven weeks in West Africa as part of an archaeological expedition. Photo by J. Cameron Monroe. The team, led by J. Cameron Monroe, below, spent long days in "the pits." Photo by P. Baker-Rabe. Photo below by Stephanie Monroe. When Philippa Baker-Rabe says a historical archaeology class changed her life, she's not exaggerating. "I took it on a whim my sophomore year and ended up loving it," recalled Baker-Rabe. "It was an 8 a.m. class, but it ended up being my favorite. I realized this is what I want to do forever." 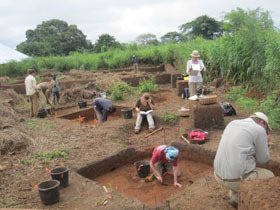 Taught by assistant professor of anthropology J. Cameron Monroe, the class opened a door that led Baker-Rabe to West Africa, where she spent seven weeks this past summer as part of UCSC's first undergraduate archaeological expedition to Benin. Under Monroe's leadership, Baker-Rabe and seven other undergraduates spent nearly two months unearthing beads, bits of pottery, and other artifacts that yield clues to the everyday lives of Africans during the 18th and 19th centuries. Galvanized by the experience, she now plans to apply to graduate school and pursue a Ph.D. in archaeology. "I was pretty excited to find my first sherd of ceramic, and about three weeks into the dig, I found a blue bead," recalled Baker-Rabe, now a senior. Lessons from the class flooded back to her as the team uncovered fragments of tobacco pipes, glass bottles, European porcelain, ironware, and ritual items. Artifacts, oral histories, and scant documentary evidence are all that remain of the precolonial history of the kingdom of Dahomey (pronounced DAH-hoe-may) in the southern portion of the Republic of Benin. The region is of great historical significance because approximately 20 percent of all enslaved Africans bound for the New World passed through the area, according to Monroe. Much of what is known about the region is based on documents related to the transatlantic slave trade, including shipping records, account books, and the diaries of European slave traders, merchants, and missionaries. But there is very little evidence of what communities were like in the West African interior. Archaeology can shed light on this lost history, said Monroe, who is tracing evidence of past settlements to learn how villagers interacted, traded, and moved between the coast, cities, and the countryside. "It was a tense and terrifying time for people" as slave raiders swept up tens of thousands of Africans and displaced many more, said Monroe, whose work is contributing to the understanding of how Africans coped with the pressures of the slave trade. "The village of Cana, where we're working, has a deep history of migration and immigration from distance regions," he said. "It became a heterogeneous, diverse community. Like Los Angeles in the 20th century, nobody was from there." Since 2000, Monroe has focused his research on excavating former palace sites and remnants of villages in an effort to assemble evidence of what buildings looked like, how goods flowed, and even what rituals were performed. "When times get tough, people get creative--about networks, the exchange of goods, and moving to safe areas," said Monroe. "Beads can say enormous things about what sorts of connections people were making." In the field this summer, Monroe shared his passion for unlocking this "silent history" with an international team of students from four countries, including Benin. 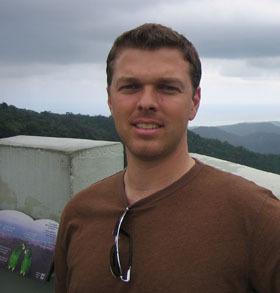 Monroe is the director of the UC Abomey Plateau Archaeological Project, which sponsored the expedition in collaboration with the Cotsen Institute of Archaeology at UCLA. The trip marked the first archaeological dig for each participant, including Baker-Rabe. "Having that access to Cameron was really amazing," she said. "The history he's finding has never been recorded. No one would ever know." The work was physically taxing: Participants rose at dawn and worked eight hours a day in the tropical sun, excavating deep pits with picks and hoes, hauling buckets of dirt, and cleaning and analyzing hundreds of artifacts. "The first week, I was really sore," said Baker-Rabe, pointing to the well-defined "troweling muscles" of her right forearm. "I was tired and sore and sunburned, and I got malaria. It wasn't easy, but I was still happy." The shared experience of working hard and learning together was deeply satisfying, and the pace of life slowed enough that Baker-Rabe said she was able to think deeply about her future. "We talked about graduate school, letters of recommendation, and different fields of archaeology," she recalled. "I had the time and the silence to think about these things critically and in terms of who I want to be." Baker-Rabe still thinks about the trip every day. And she still gets her hands in the dirt every week as part of a class excavating the Cowell Lime Works Historic District at the base of campus. For Monroe, the expedition advanced a pressing research agenda. The team spent several weeks excavating rural sites he discovered in 2007. Upon closer examination, two sites appear to have been quarries where iron-rich, pebbly earth was removed, probably for use in the construction of royal palaces. As such, they may represent evidence of African slave-labor camps, a significant discovery. "If these sites were work camps, we can get in and see the inner workings of a precolonial slave community in West Africa for the first time," said Monroe. "Slavery existed in Africa before the Europeans, and this kingdom was heavily entrenched in the slave trade. It's terribly exciting." He plans to conduct intensive excavation of the sites next summer, when he expects to enroll 15 students and volunteers in the field program. "I like training students," he said. "It's good experience for them, and their work contributes to broader research questions." Monroe is eager for answers to those questions. "We know a lot from historians and anthropologists," he said. "But archaeology can reveal complex settlement patterns, and when we get answers to those questions, we'll know a lot more about the everyday lives of precolonial Africans."